A stretch near Circuit Road, Pahalgam. According to sources, in the year 1944, some plots were created in Pahalgam under 60c (of J&K gazette), but nobody back then was given its possession. But now, sources alleged, as government recently announced a revised Master Plan for developing Pahalgam, the revenue department has suddenly started earmarking plots on both sides of the Circuit road without any prior consent from the forest department. 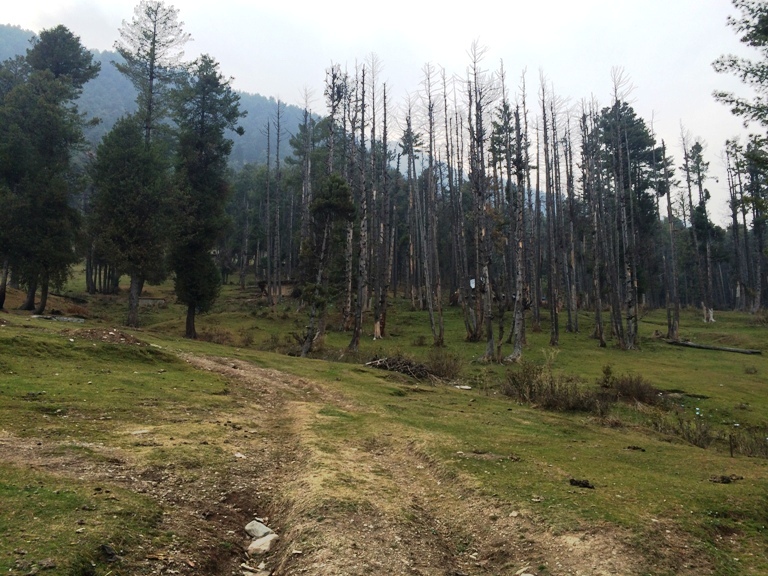 The area is dense forest and one of the ecologically fragile parts in Pahalgam. The creation of plots is likely to result in felling of thousands of green trees, sources in the knowhow said. In a recent RTI query filed by Himalayan Welfare Association (HWA) –vide no 240-41 dated 23-10-2015 – a copy of which lies with Kashmir Life, the forest department revealed that they did not surrender any forest land under 60 C of 1994, suggesting that the revenue department was blatantly violating the norms. He said that instead, the department is planning to go ahead in allowing the settlements to come up on dense forest land in compartment No: 34 L, 35a L, 35b L and 36 etc. “Obviously some very powerful people are behind this, for whom this whole facade of plot cutting and settlement is being carried out,” he said. Apparently, some of these “influential people” have already encroached upon the forest land while the rest are awaiting settlement orders from the revenue department. “For last 72 years there were no takers for these plots, and now all of a sudden revenue department is allotting land in Pahalgam to influential people by using 1944 order,” asks Pahalgami. Source reveals that since there is a carpet ban on new construction in Pahalgam after a local welfare organization filed a PIL in 2010, revenue department in nexus with land mafia are using a 1944 allotment order to encroach land on eco-fragile Circuit road.